Beer sales in pubs have slumped to their lowest level since the 1930s, brewery representatives have said. The British Beer and Pub Association (BBPA) says total beer sales for 2007 are down 22% - some seven million pints a day fewer than their peak in 1979. Since then there has been a 49% drop in pub sales, which has been partly offset by an increase in purchases from shops. Last week, the Alcohol Health Alliance called for alcohol tax to rise but the BBPA wants a freeze on beer duty. Total beer sales - in pubs, off licences and supermarkets - have fallen from 12 billion pints a year in 1979 to 9.5 billion in 2007, according to BBPA figures. Pubs have been particularly affected. Some 29 million pints were sold each day in pubs 28 years ago, compared with 15 million pints a day this year. In a letter to MPs, the association said increases in costs such as barley, malt, glass, aluminium and energy were cutting brewers' profits. The BBPA said tax on beer had increased by 27% since 1997 - compared to 16% for wine, 3% for spirits and 11% for cider. BBPA chief executive Rob Hayward told MPs: "We believe the benefits that have been enjoyed by other drinks from a tax freeze should be extended to Britain's national drink - beer. "We are calling for government policy to encourage and support Britain's businesses. "British brewers and beers are of world renown. Please join us in our call to the chancellor to freeze beer duty." 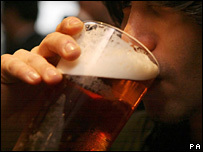 The BBPA also said the smoking ban had had an effect, with a 7% drop in pub beer sales this year alone. "The smoking ban is reducing sales of beer in pubs and will continue to do so," said a spokesman. Changing tastes among younger drinkers, many of whom opted for wine, had contributed to declining beer sales, he added. The "absence of a level playing field" in alcohol taxation also played a crucial role, the spokesman said. The Campaign for Real Ale (Camra) said it backed the BBPA's call over tax on beer "completely". A spokesman said: "It is no coincidence that Britain has the highest level of excise duty in the EU and sales in the on-trade are falling, and yet binge-drinking is on the increase as supermarkets cynically exploit the consumer by offering cut-price booze to drink at home. "A pub is the proper place to enjoy a drink in a responsible and regulated atmosphere." The Alcohol Health Alliance - a new group of 24 leading health organisations - said taxes on alcohol should be increased and advertising restrictions tightened. Raising the price of alcohol by 10% could cut alcohol-related deaths by between 10% and 30%, the organisation said. The BBPA's members brew 98% of the UK's beer and include nearly two-thirds of the country's 58,000 pubs.